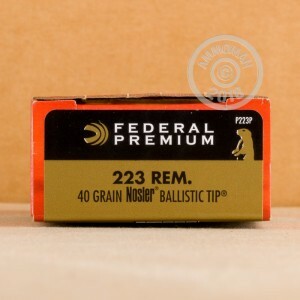 Pesky critters be gone with this 223 Rem Nosler Ballistic Tip ammo from Federal! 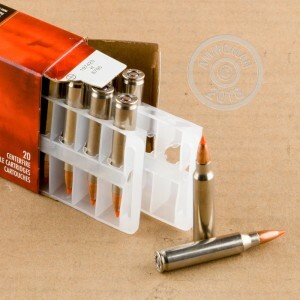 This ammunition is a member of Federal Premium's V-Shok line of ammo. This line is known for its great ballistics. The 40 grain projectile has a muzzle velocity of 3700 feet per second and muzzle energy of 1216 ft/lbs. No varmint is getting away with this powerful hit. A Nosler ballistic tip bullet will deliver accuracy and consistency required for a clean kill. It will retain more than 2/3 of its original weight for deep penetration and create a devastating wound. Your 20 rounds of 223 Rem ammo will arrive in brand new condition. They will have boxer primed brass casings and can be reloaded if that's of interest to you. 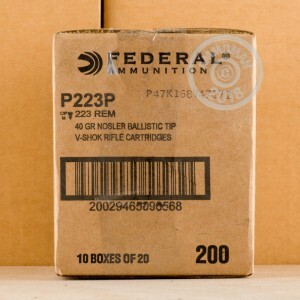 Federal Ammunition Company was founded in 1922 by Charles L. Horn in Minnesota. They manufacture shotshell, centerfire and rimfire ammunition and components at their headquarters in Anoka, Minnesota. Federal Premium is the company's flagship brand and competes with other leading manufacturers by staying on top of the most current technology. You can't go wrong with Federal.